This plant prefers some water nearby and grows best next to a stream or on a low slope. It can handle dry conditions in the shade. 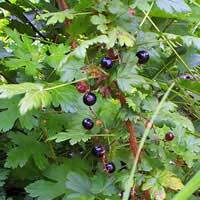 Smaller than the more edible variety of gooseberry, the small fruits of black gooseberry are best left to wildlife. The flowers are a favorite of hummingbirds. The profuse thorns can cause allergic reations in some individuals.